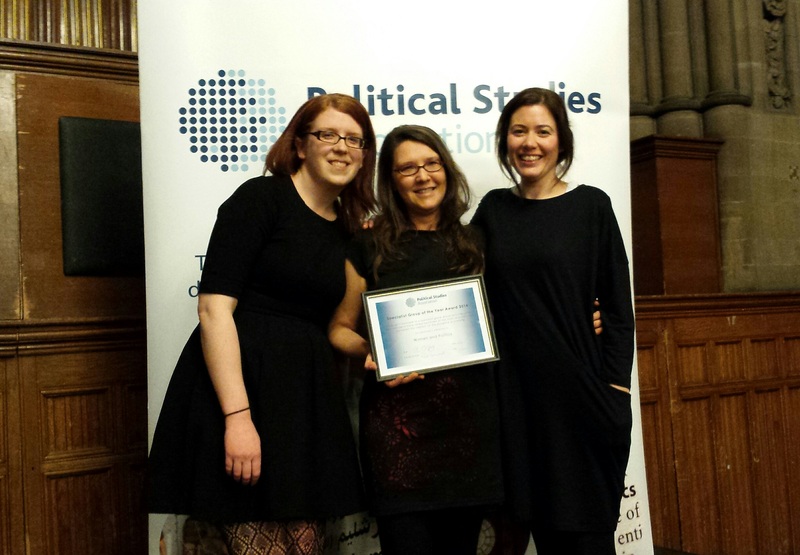 We are delighted to announce that the Women & Politics Group has won the 2014 UK Political Studies Association Specialist Group of the Year Award. The prize is awarded to a specialist group whose activities within their specialism have raised awareness of the study of politics and increased the ‘impact’ of the discipline as a whole. We would like to extend a big congratulations to our outgoing convenors Dr. Liz Evans (Bristol) – who nominated the group for the award – and Dr. Kristi Winters (GESIS). Above all, we would like to congratulate and thank our members – the judging panel noted that while research impact is a relatively recent preoccupation in political science, the members of the Women & Politics group have been engaging in impact activities for decades. The ceremony took place in Manchester’s historic Town Hall at the annual PSA conference in April. Meryl Kenny (Leicester), Liz Evans and Kristi Winters accepted the prize on behalf of the group from Shami Chakrabarti, Director of Liberty and PSA President Professor Charlie Jeffery.